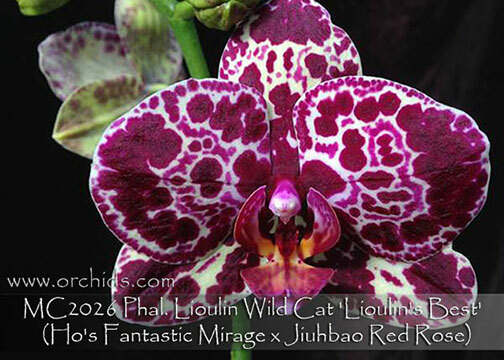 The best of a great new direction in breeding, the result of Phal. Ho’s Fantastic Mirage, a harlequin from Golden Peoker, and Ho’s French Fantasia, a modern French spot ! Its pollen parent, Phal. Jiuhbao Red Rose, a large modern deep lavender, lends to a larger flower size while the resulting hybrid maintains compact leaves for this type of breeding. A free-bloomer, its harlequin patterning will vary slightly depending on light and temperature at the time of bud formation. An exciting new harlequin and Very Highly Recommended !